These little bites are great to keep around for when you want something, but you don't know what. You don't want a full on dessert or snack, just a nibble of something -- not too sweet, but just sweet enough to satisfy that unknown desire. These healthy bites are perfect for that. They can be a breakfast nibble, an afternoon snack, a pre-gym tied-me-over, or an after dinner treat. My goal was to make something from what I already had in the pantry, so no special trip to the grocery store for these. Of course, I ran out of a few things making them so I'll put them on my list for my next trip to Trader Joe's. 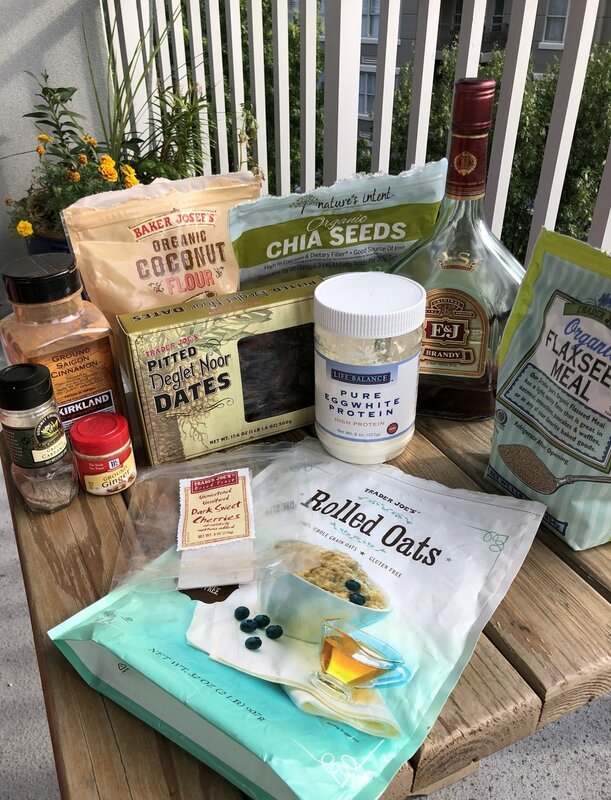 I've collected these items from various baking projects and don't expect everyone to have these exact ingredients in their pantry, but you can easily modify based on what you do have! My other goal was to make something with ingredients that are good for you, with no added sugars. Y'all know I eat sugar, but these weren't meant to be a full on dessert. The idea was to create something with a little natural sweetness and chewiness, but still something that's healthy for you. Optional: For a little sweeter of a treat, throw in a few chocolate chips, or drizzle on some honey after they come out of the oven. These bites don't have any ingredients with added sugar in them as the base, so that leaves you a little wiggle room for those extra goodies to fit your personal preference. Mine turned out to be more of a thick disk shape than a ball shape, but it's whatever you want! 1. Mix: Stir everything together in a bowl. Let it sit for a few minutes for the water to absorb into the ingredients. Mix again with your hands. 2. Roll: Use a tablespoon measurer to scoop out and roll the dough into bites. You'll need to press it a bit as you roll it to get it to stick together. 3. Bake: For 10 min. I'm not a breakfast person, but this is exactly the type of thing I could eat to get me going, because it's healthy, not too big, and not too sweet!"